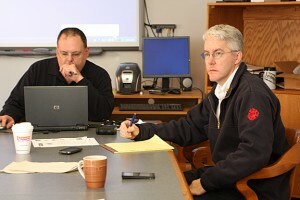 Naugatuck Fire Chief Ken Hanks, left, and Second Assistant Chief Paul Russell coordinate Naugatuck's emergency efforts in headquarters at the Naugatuck Fire House Monday morning. With power out in over 740,000 residences across the state, many area residents are facing a week or more without power, according to representatives from Connecticut Light and Power. Several major transmission lines are down in the area, causing mass outages, CL&P said. As of 2 p.m. Monday, 99 percent of residents in Beacon Falls remained without power, as did 100 percent of Prospect. In Naugatuck, the area around City Hill and Indian Hills were reconnected to the grid last night, reducing the number of homes without power from a high of 95 percent down to 72 percent, according to CL&P’s website. Area towns have responded by opening up emergency shelters in several locations last night. About 20 people stayed overnight at Andrew Avenue School in Naugatuck, according to Mayoral Aide Ed Carter. A similar number stayed at the Beacon Falls Senior Center, according to Jeremy Rodorigo, spokesperson for Beacon Hose Company #1. In Prospect, about 60 people slept on cots at the Fire House last night and about 400 people took showers, according to Mayor Robert Chatfield. School was canceled in Naugatuck and Region 16 Monday, and school will be closed again in Naugatuck Tuesday. Region 16 had not made a decision as of this post. In Prospect, Chatfield reported no injuries or accidents caused by the storm that dumped over a foot of snow in some parts of the state. He said EZ Way Products donated enough paper goods to supply the town shelter for the next few days. Chatfield said about 600 people have signed up for the town’s CODE RED system that notifies residents in case of an emergency since Saturday. Officials in all three towns have been relying on the system, which calls residents home or cell phones to relay messages about emergency provisions. 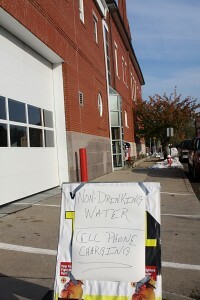 However, many residents are not getting the message because phone lines are down and cell coverage spotty, officials said. In Beacon Falls, members of the fire company canvased the town with leaflets yesterday to let residents know about shelters and safety procedures, according to Rodorigo. “We’re trying to be as accommodating to everyone as we can,” Rodorigo said. Trees and downed power lines are still blocking several roads in all three towns, officials said. They said they must wait until CL&P de-energizes the lines and makes sure they’re safe before town crews can start clearing roads, something they hoped would happen today. “They all have to be coordinated and work together,” Carter said. Chatfield asked “wood fairies” to help by removing wood lying on the sides of roads. But, he warned, be careful and don’t touch wood that is tangled in electric wires. Officials reminded residents to treat out-of-commission stoplights as stop signs, stopping at intersections. They also reminded people to be careful with candles and other open flames and to make sure generators are in a well-ventilated location. Generators indoors can cause carbon monoxide poisoning, officials warned. With some many without power, businesses with power have been doing a hopping business. Restaurants along Church Street were busy last night, according to Carter. Cars lined up along the road to get into the few gas stations with power in Naugatuck Monday morning. In Naugatuck, trash and recycling pick-up remains on schedule, but leaf pick up has been postponed to a later date, according to Mayor Robert Mezzo’s blog. The Halloween tradition of dressing up in costumes and going door-to-door begging for candy has been postponed this year due to dangerous conditions on area streets following Saturday’s snowstorm. Naugatuck has postponed its annual American Legion/Naugatuck Firefighters Halloween Parade, originally scheduled for today to Saturday at 4:30 p.m. Trick-or-treating is also rescheduled to Saturday, Nov. 5, officials said. In Prospect, Mayor Robert Chatfield urged parents not to take their children trick-or-treating tonight because there are no streetlights and many streets are blocked by downed trees and wires. He said he was working on an alternative to trick-or-treating. In Beacon Falls, officials were also working on an alternative to trick-or-treating. No decision had been made as of this post. 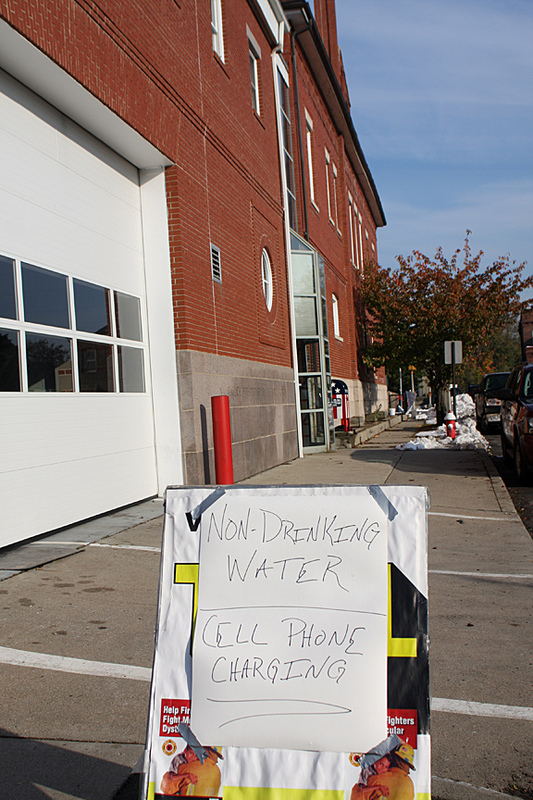 Water is available for utility purposes at the Naugatuck Fire House. Overnight shelter: In Naugatuck, Andrew Avenue School and City Hill Middle School will be open for the night beginning at 5 p.m. Oak Terrance Senior Housing has 25 cots available for Naugatuck senior citizens. The Prospect Fire House, Beacon Falls Senior Center, and Woodland Regional High School will also be open for overnight shelter. Admittance to overnight shelters is on a first-come first-serve basis. Town officials ask residents to bring pillows and blankets. Naugatuck residents in need of emergency transportation to a shelter may contact the Naugatuck Fire Department at 203-720-7082. Food: In Naugatuck, hot meals are available at Andrew Avenue School and prepackaged meals at City Hill Middle School. Both locations will serve a hot breakfast Tuesday morning. Free snacks and beverages are available at Andrew Avenue School, the Naugatuck Senior Center, Whittemore Library and Congregational Church. In Beacon Falls, meals are available at the Senior Center.